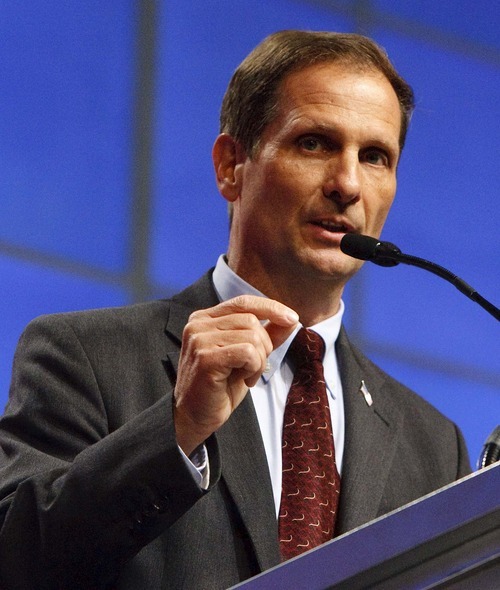 Public lands • Freshman congressman wants federal agencies to rely on locals for muscle. 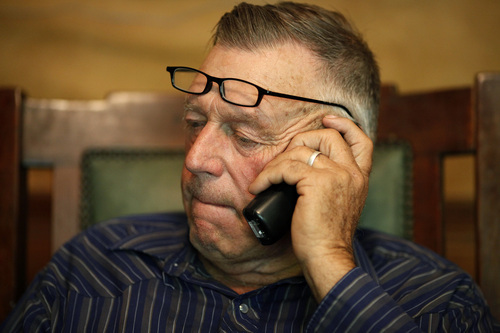 File | The Associated Press Cliven Bundy talks on the phone at his ranch near Bunkerville Nev. Leah Hogsten | The Salt Lake Tribune Rep. Chris Stewart, R-Utah, won the 2nd Congressional District nomination with 67 percent of the votes at the Utah Republican Party 2014 Nominating Convention at the South Towne Expo Center, Saturday, April 26, 2014. Leah Hogsten | Tribune file photo Utah Gov. 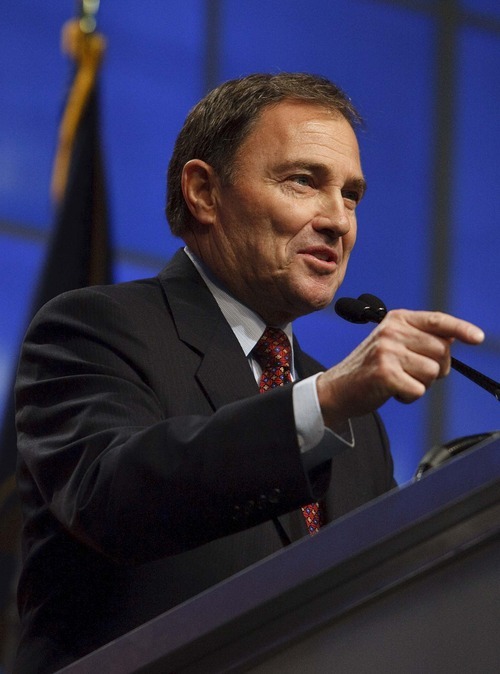 Gary Herbert said Nevada rancher Cliven Bundy "should not be the face for public lands issues in Utah." 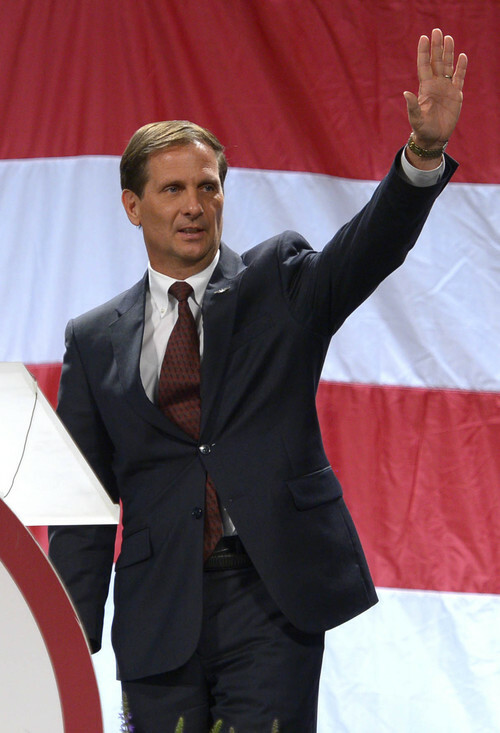 Leah Hogsten | The Salt Lake Tribune 2nd Congressional District incumbent Chris Stewart is the nominee with 67 percent of the votes at the Utah Republican Party 2014 Nominating Convention at the South Towne Expo Center, Saturday, April 26, 2014. 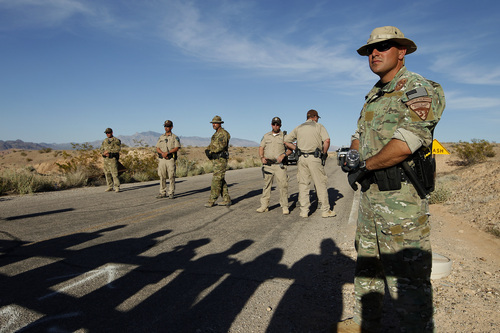 Federal law enforcement officers block a road at the Lake Mead National Recreation Area near Overton, Nev. Thursday, April 10, 2014. In the foreground are the shadows of protestors. Two people were detained while protesting the roundup of cattle owned by Cliven Bundy on the road. 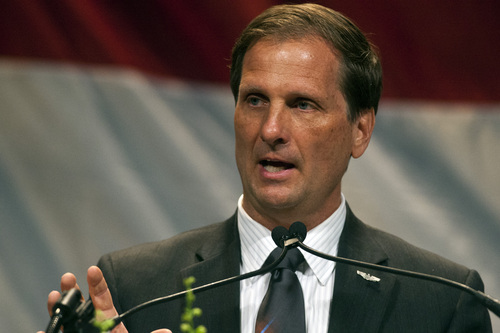 (AP Photo/Las Vegas Review-Journal, John Locher) Rep. Chris Stewart ï R-Utah Chris Detrick | Tribune file photo Rep. Chris Stewart has a big financial lead in campaign fundraising in Utah's 2nd Congressional District, which includes Salt Lake City. 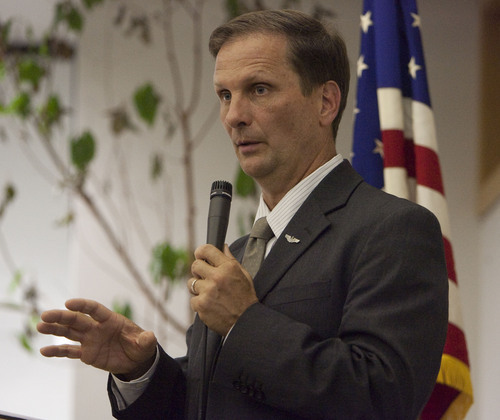 Leah Hogsten | Tribune file photo Republican Chris Stewart is running for the 2nd Congressional District against Democrat Jay Seegmiller. 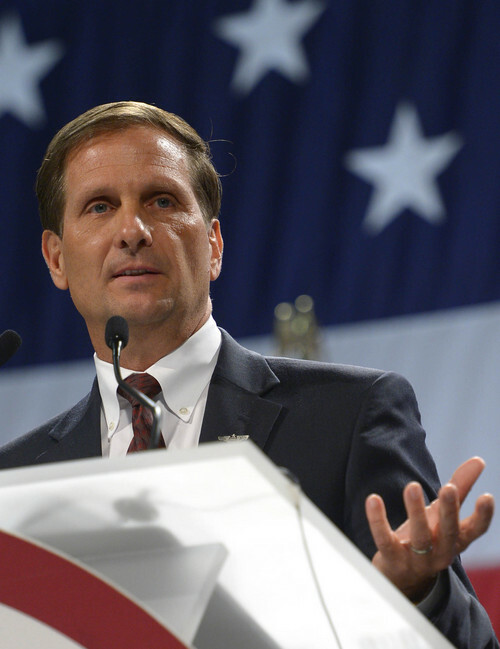 Washington • The Bureau of Land Management doesn&apos;t need its own heavily armed police force, Rep. Chris Stewart said Tuesday, referencing the recent standoff between federal agents and a civilian militia siding with Nevada rancher Cliven Bundy. Stewart, a member of the House Appropriations Committee, says he&apos;s going to try to cut funding for any "paramilitary units" and require the BLM, Internal Revenue Service and other regulatory agencies to rely on local law enforcement rather than their own armed crews. "There are lots of people who are really concerned when the BLM shows up with its own SWAT team," the Utah Republican said off the House floor Tuesday, noting that land managers aren&apos;t the only government agents with serious firepower. "They&apos;re regulatory agencies; they&apos;re not paramilitary units, and I think that concerns a lot of us." The BLM sent dozens of law enforcement officials to help with security surrounding the roundup of Bundy&apos;s cattle after a court ordered their seizure in a 20-year-long dispute about grazing rights. Bundy doesn&apos;t recognize federal control of the public lands near his ranch where he lets his cattle roam; two federal judges have disagreed and upheld more than $1 million in fines and fees against Bundy. Faced with a small army of Bundy supporters, many with guns, the BLM backed off and released the cattle in hopes of finding a nonviolent solution to the dispute. Stewart, who insists he isn&apos;t taking sides in the Bundy showdown, says he was shocked to see the government&apos;s response and believes it led to the civilian militia that showed up to defend the rancher. But Stewart says agencies such as the BLM should defer to local police for muscle instead of bringing in their own. "They should do what anyone else would do," Stewart said. "Call the local sheriff, who has the capability to intervene in situations like that." Stewart, a freshman lawmaker seeking a second term this election year, could find powerful friends in his targeting of such special-force units in government agencies. Sen. Rand Paul, R-Ky., told WHAS radio of Louisville, that the feds shouldn&apos;t have "48 federal agencies carrying weapons and having SWAT teams." The Interior Department stressed Tuesday that the BLM and National Park Service had law enforcement personnel present during the Bundy cattle roundup to provide safety for their employees and the public. Spokeswoman Jessica Kershaw added that there are about 300 law enforcement officers under the BLM&apos;s direction to provide support on 245 million acres of public land, prompting a need already to work with local officials. "Partnerships and coordination with local law enforcement are a key part of the equation," Kershaw said, "not just because it&apos;s good government, but because of the need to leverage limited resources." She noted the BLM does not have SWAT or tactical teams. Pat Shea, a Utahn who oversaw the BLM under President Bill Clinton, says Stewart&apos;s idea is worth considering but he warns that there are reasons the nation hasn&apos;t consolidated its law enforcement agencies under one umbrella. "It&apos;s certainly worth something to examine, but we come up against the old adage: Be careful what you wish for," Shea said. "Besides the military, we could end up with a national police force. That could make black helicopters look like biplanes."